A new report titled Red Water documents the social, environmental, economic, and health impacts of gold mining in Porgera, Papua New Guinea. The report finds that the communities affected by mining do not have access to consistent and safe drinking water. This is due, in part, to the fact that the PNG government has not met its human rights obligations to respect, protect, and fulfill the right to water in Porgera, and because companies that own and operate the mine — Canadian company Barrick Gold and Zijin Mining from China — are in breach of their responsibilities to respect the right to water. Red Water finds that the Porgera Joint Venture (PJV) gold mine poses direct threats to the social and economic rights of communities living near the mine. These key findings are a result of a four-year study conducted by Earth Institute scientists, Pennsylvania State University scientists, and Columbia Law School Human Rights Clinic faculty and students. The investigation conducted over 177 interviews and meetings and collected and analyzed 45 sediment samples from streams adjacent to the PJV gold mine, 25 soil samples from local residents’ household gardens, and water samples from 64 sites. Homes near the mine do not have running water inside them. The PJV releases mine waste, known as tailings, from the mine facility into the Pongema River at an average rate of over 14,000 tons per day. 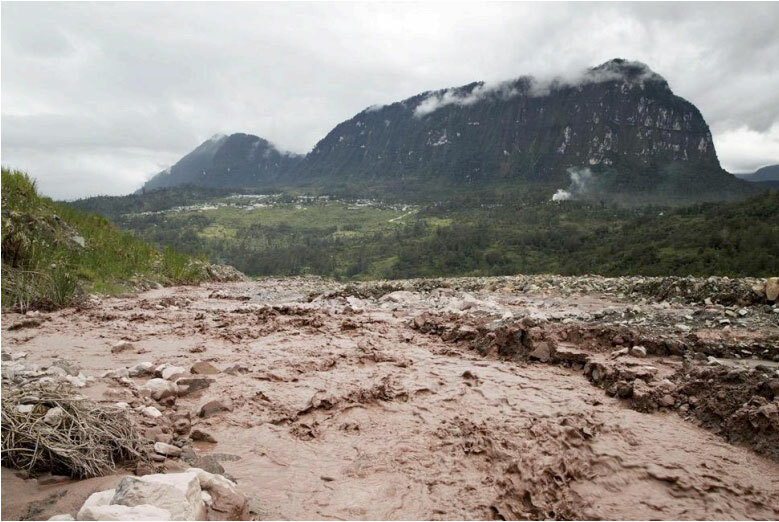 The tailings discharge forms what local residents refer to as the “Red River.” A 2013 study noted the catastrophic environmental consequences of tailings discharge and noted that of the 2,500 industrial-sized mines in the world, only four mines — three of them in PNG — were found to rely on riverine tailings disposal. According to one resident of Porgera, the local residents are “in a desperate situation. [Our] environment is not in a good condition.” Moreover, with a changing climate, water insecurity in the area is an acute problem. The Porgera gold mine has been one of the world’s highest-producing gold mines over the course of its quarter-century history, and has accounted for a considerable percentage of PNG’s economic income. The mine, which began operations in 1989, has long been contentious, and has generated global attention for both violence by security personnel and allegations of environmental degradation. The mine is owned by the PJV with a 95 percent share held by the mining companies. Publicly commit to advance the human right to water in Porgera. The report recommends that the consortium of mining companies publicly announce a commitment to initiate a multi-stakeholder process to create a Human Right to Water Policy for the Porgera Joint Venture. Work with the government of PNG to promote consistent access to adequate amounts of clean water for household uses in Porgera. The companies, in partnership with the Papua New Guinea government and in consultation with Porgeran communities, should invest in infrastructure improvements to provide adequate sources of safe water at the household level. Immediately pledge to carry out an independent environmental and social audit of the PJV. This must be a full audit examining all the social, environmental, and health effects of the mine, including on water, land, flora, fauna, and human health. The results of the audit must be made public and accessible, especially for potentially impacted communities. Adopt necessary laws and regulations to ensure that Canadian corporations respect human rights in their extraterritorial activities, and that there is access to remedy where such activities breach international human rights. A launch event for the report will be held in April and will involve the research team and members of human rights and international development groups. The report was supported by Columbia Law School’s Human Rights Clinic and a Cross-Cutting Initiative grant from Columbia University’s Earth Institute. SUBJECT: SEEKING YOUR URGENT APPROVAL OR MEDIATION FOR COMPENSATION FOR ENVIRONMENT DAMAGE UNDER SECTION 87 OF ENVIRONMENT ACT,2000. For and on behalf of the Kulini Strickland Resource Holders Association and its members I bring to your attention the subject matter above . The Association has given you several notices(maybe 6 times) already and we have met statutory requirements,in accordance with Section 87 which empowers you, The Director to direct the permit Holder, in this case – Barrick Nuigini Ltd to pay for environment damages. There is absolutely clear and amble evidence here that tje Managing Director for Environment Conservation Protection Authority rested with the power to determine pr give direction to thePermit Holder ( Barrick Gold PNG) Ltd to compensate the affected or impacted landowners or to simply begin arbitration. We claimed K60 million , but as you know it is subjected to arbitration. 2: Letter from the Minister dated 9th Septmber 2014 (Audit). 8: The correspondencecorrespondence of send to the Acting Secretary, Gunther Joku dated 26th September 2013, a 7 page letter. So far after waiting patient for over 16 years and enduring all the hardships and inconvenience the affected communities faced, we are convinced beyond doubt that our claims is genuine. Secondly we have been push here and there when our issue should be frankly and humanely address by the concerned authority-Managing Director for CEPA who is also vested with the power of Director of Environment and Conservation. We have followed all the due processes,meet legal requirements as evidence before eyes therefore we are giving you the ultimate notice to respond favourably and make some decision that are fair to us,Barrick Gold(PNG) Ltd,the Government of PNG and the people of Porgera,Lagaip and Strickland Riverine basin. Sir, the official correspondence send to you have fallen on deaf years as you could not given a second thought to the plight of the people whose livelihood depends on their environment. The extend of the damages have been drastic yet,the government and especially the company have come up with so many excuses and delay tactics to frustrate the process or the people who are adversely affected. While other government agencies continue to support us to find solution or alternatives,you have continuously your minister continuously failed us due to ignorance or down play our sufferings as unrealistic and our claims are being false. The legal provision is clear and we understood the the situation or mandatory requirements and at the same time we know how much power is vested in you to make some decision to make fair to all parties involved. It is in our view that your continuous use of delay tactics and treating this issue as secondary makes us wonder whose interests you serve as the Managing Director for CEPA and the Director of Environment. Your ignorance and failures to address this issue in a timely and appropriate manner satisfactorily to all the parties primarily the Water Permit Holder,Barrick Gold (PNG) Ltd and landowners of the Riverine Communities affected adversely is a disgrace to the government. You are simply failing the state (Go PNG) and others including the silent major affected Riverine Communities which I represent. Therefore we now urge you to act upon this matter that in the interest of the state,the mine operator and the affected communities along the Lagaip Strickland and Dumbudu River Systems. The government and company enjoy the benefits of the operations,yet the silent and the innocent Riverine Communities suffer which is unjust. Barrick denied responsibility,but it had been paying sporadically even beyond SG3 and SG4 biannually. This showed guilt and acceptance of responsibility that it had polluted the river systems. Although the Ministers Determination of 1996 determines K0.025t per tonne of sediments and K0.062t per tonne for tailing for Zone 1 , Barrick had been paying less. Zone 2 and some part of Zone 3 area were paid under Hayley Robinson Genealogy Study which is incorrect because individual compensation agreements for Zone 3 were not signed, Barrick continuously paying Zone 3 river landowners but their compensation is pathetic. Our position is clear and straight forward- we have followed normal process as stated Under Environment Act 2000 Section 87 but you as the boss and Department seem to pursue another agenda. We have waited and suffered enough due to the delay as a result of Department ignorance or simply your inability to perform mandated commitment task, especially carrying out Environmental Audit and determine the issue which we pursued. To conclude, we have followed due process process stated Section 87 Environment Act 2000 but you and your department have miserably fail to apply Act2000 Section 87. The Environment Act is clear that person who is affected or has suffered damage as a result of the operation of the Permit Holder, the person who is entitlksed several time notice then we lodged our notice to you and your department to determine the issue of compensation within 90 days period but your department have exhausted till now. Therefore,due to time constraints and waiting patient 2004 to 2019 you as the Director of Environment can give directions or orders to Permit Holder in this case Barrick PJV to pay KSRHA compensation claim of K60million and secondly your department to incured the KSRHA expenses spent over the 16 years on Airfare tickets,Hire car,Accommodation and Administration cost. With Kind Regard We Remain. People living along Strickland and Dumbudu River area were greatly affected as a result of Porgera Mine tailing discharge, we did submission to Permit Holder Barrick PJV and Conservation Environment Protection Authority formly Environment Conservation and followed Environment Act 2000 & Section 87 however concern authorities have miserably fail to address it till today and impact along down stream and up stream remains unchange as it is. Porgera Mine Audit committement was made in 2009 after legal advice was source by KSRHA in 2008 September waiting till now becoming another issue which PNG government neglected to conduct Environmental Audit and address the issue am representing. The letter forward to you for you help and also fine some solutions in order for PNG government to speed up the Audit process. Representing down stream Strickland and Dumbudu River in the Hela Province.